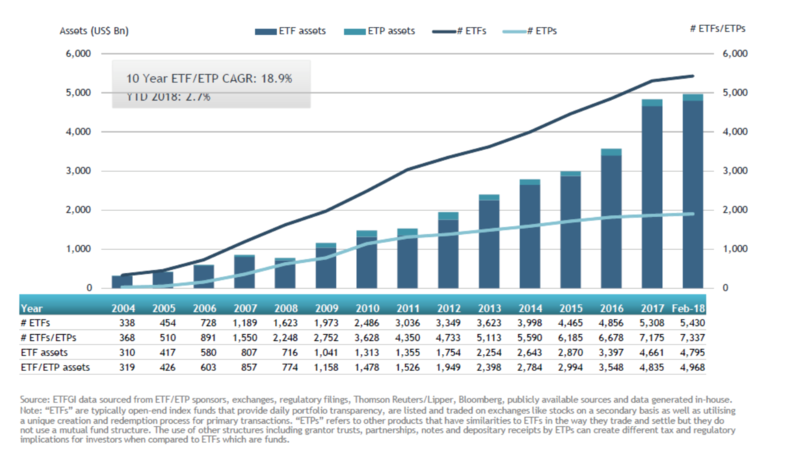 According to ETFGI’s February 2018 Global ETF and ETP industry insights report, an annual paid-for research subscription service, assets invested in ETFs/ETPs listed in globally decreased by a record $180.10 Bn in February 2018. The decrease of 3.50%, from $5.148 Tn at the end of January 2018 to 4.968 Tn, also represents the lowest monthly growth in assets since January 2016, when assets decrease of 4.69% from $2.994 Tn to $2.853 Tn. February 2018 also marked the 49th consecutive month of net inflows into ETFs/ETPs listed globally, with $12.38 Bn gathered during the month; 81.87% less than net inflows during this month last year. 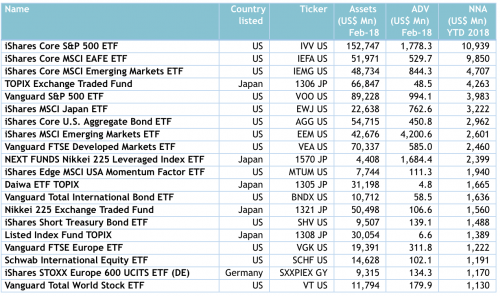 The majority of the monthly net new inflows can be attributed to the top 20 ETFs by net new assets, which collectively gathered $61.8 Bn during 2018. The iShares Core S&P 500 ETF (IVV US) on its own accounted for net inflows of $10.94 Bn. 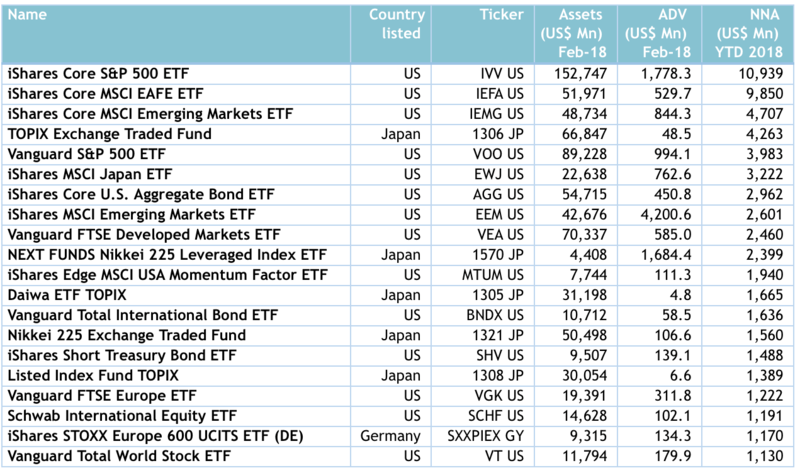 Top 20 ETFs by net new assets: Global Similarly, the top 10 ETPs by net new assets collectively gathered $4.44 Bn year-to-date during 2018. Top 10 ETPs by net new assets: Global Globally-listed Equity ETFs/ETPs gathered net inflows of $1.42 Bn in February, bringing net inflows for 2018 to $89.08 Bn which is less than the $91.35 Bn in net inflows at this point last year. Fixed Income ETFs and ETPs gathered net inflows of $3.20 Bn in February, growing net inflows for 2018 to $14.76 Bn which is less than the $27.52 Bn in net inflows at this point last year. Investors have tended to invest in core, market cap and lower cost ETFs in February 2018 with the he iShares Core S&P 500 ETF (IVV US) and iShares Core MSCI EAFE ETF (IEFA US) capturing most of the flows.